This plugin provides details on all the travel locations in the game except for some boats. For each location you can list all the destinations with costs and travel restrictions. It can also find the best route between any two stable locations and factor in Milestone/Return/Guide/Muster skills, even providing a clickable icon for the skill when it provides the best route. With the travel window, an optimal route can be found between any two connected locations. For complete details, be sure to check the ReadMe file. 10/12/18 2.18	Added Dwarf-holds (Lotro Update 23). 10/06/18 2.17.2 Changed "W-s King's Men" to "the War-stead". 09/26/18 2.17.1 Fixed spelling of Tham Taerdol. 03/07/18 2.17	Added Strongholds (Lotro Update 22). 08/18/17 2.16.1 Added Return/Guide/Muster to a-b Minas Tirith. 08/09/17 2.16	Added Mordor (Lotro Update 21). 08/07/17 2.15.1 Added Return/Guide/Muster to War-stead. 10/21/16 2.15	Added March of the King (Lotro Update 19). 04/19/16 2.14.1	Fixed undefined value error. 04/13/16 2.14	Added Far Anorien (Lotro Update 18). 03/06/16 2.13.4 Added "/tr gm" for learnable Guide/Muster. 03/06/16 2.13.3 Added "Set Returns" and "Guide/Muster" buttons. 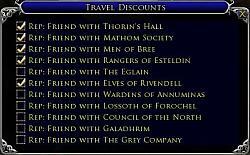 03/06/15 2.13.2 Added Return/Guide/Muster to Minas Tirith. 02/05/16 2.13.1	Filtered learnable Return To by level. 10/28/15 2.13	Added Old Anorien (Lotro Update 17). 05/06/15 2.12	Added East Gondor (Lotro Update 16). 11/05/14 2.11	Added Central Gondor (Lotro Update 15). 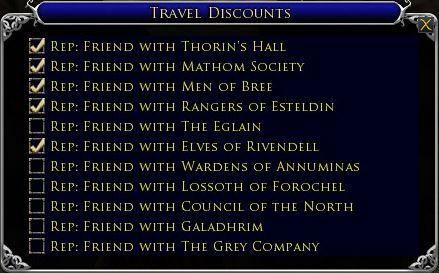 07/15/14 2.10	- Added West Gondor for Lotro Update 14. 14/15/14 2.9	- Revised for Lotro Update 13 changes. 11/11/13 2.8 - Updated for Helm's Deep expansion. 05/13/13 2.7	- Added Wildermore locations for update 11. 03/11/13 2.6	- Added Manual Travel linking routes. 01/25/13 2.5	- Added window auto-open option to Plugin Manager. 10/16/12 2.4	- Updated for Riders of Rohan expansion. 08/07/12 2.3 - Added Milestone travel skills. 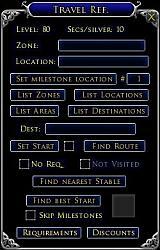 07/30/12 2.2 - Added Guide/Muster travel skills. 07/25/12 2.1 - Added action slot for travel skills. 07/20/12 2.0 - Added "Return to" skills for routing. 03/17/12 1.13 - Added travel sites in Great River, update 6. 10/15/11 1.12 - Added RoI expansion locations. This version adds the new Dwarf-holds zone with 5 new stable locations that is part of Lotro update 23. The zone is split between 2 areas, Iron Hills and Ered Mithrin, but it's all well connected by travel routes (and took hours to time all the routes). Slight setback... I had over 90% of the edits done, but while I was AFK, Windows decided that it was time to install an update and rebooted my computer without saving my edits! So I'm editing the changes again and maybe by tomorrow I'll be done. This new Lotro update adds a new zone with 5 new stable locations. I've visited the new locations to create TR entries, but I still need to add the travel times for each new route (which mean that I have to travel them all with a timer running). I expect to have it ready to release in another day or two. This is a minor update that corrects the spelling of Tham Taerdol, which caused runtime errors on some route searches. This adds the 5 new stables in Strongholds area that is part of Lotro update 22. There is also a new Return/Guide/Muster and 3 new factions in this level 115 area. This is only a minor update. While reviewing Quartermaster items I noticed that there is also an after-battle version of Minas Tirith, so this adds support for the Return/Guide/Muster ability for that location. This version adds the new travel locations in Mordor with update 21. Curiously, only travel between "The Slag-hills" and "Udub Foothold" requires a quest completion, so from most major travel hubs you can unlock an initial connection to "Magh Ashtu" for one mithril coin and then access the rest of Mordor behind the black gate. Once unlocked, you only have to be level 90 to revisit. There were some missing Return/Guide/Muster locations that have also been added. If any non-Mordor stables have changed other than adding a route to "Magh Ashtu", please let me know so that I can update them. I have only done some spot checks. There are Muster/Guide/Travel skills to barter for the War-stead, also for After-Battle Minas Tirith, and for the Camp of the Host. Thanks for the note. I plan on including those in the Mordor version, which I'm currently testing. I toured the new region "the Wastes", but didn't find any new stables. If you find any changes elsewhere, please let me know, but it doesn't look like there is anything to add for Update 20. This version adds the new March of the King area in Mordor as part of Lotro update 19. While this area's central location, Osgiliath, connects to the usual hub locations, there is no direct path to other areas. 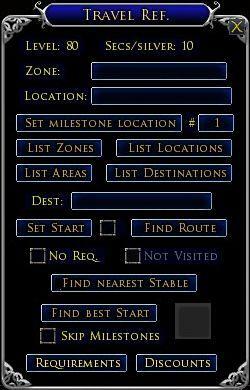 To get to the new area for the first time, you either have to complete the prior epic quest line or spend a mithril coin at a connecting stable. Note: I made a guess on the travel discount for this area. I've tested the changes, but as usual, if you find any problems please report them. A new region with new stables, new recalls and a new rep group. I've started updating the plugin and will post after it's been tested. Doing all the travel timing will take a while.